1871 - The year we earned our name? 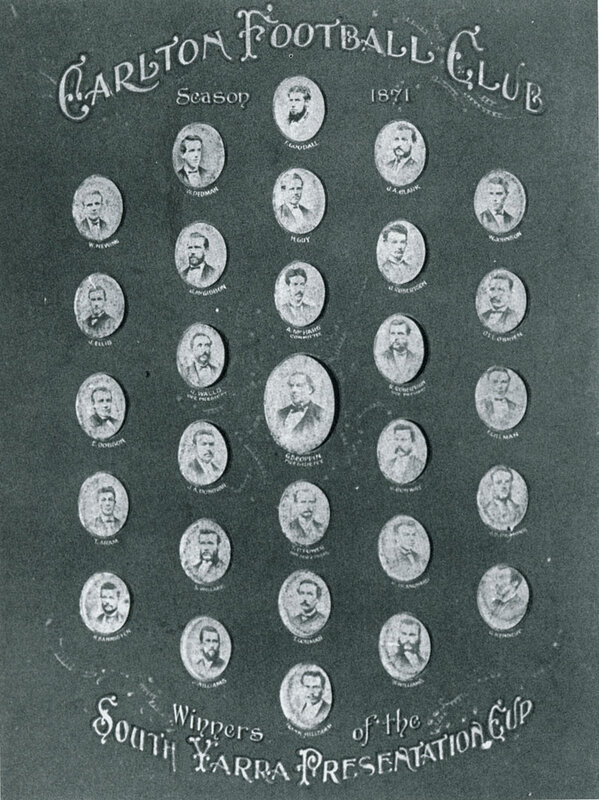 1871 was the year of Carlton's Second Premiership. Research into the 'Navy Blues' motto held proudly by the Club brings us back to Season 1871, the year in which Carlton earned some of it's first success. Carlton players wore a dark-blue navy cap in winning the 'South Yarra Challenge Cup', a colour which appears to have stuck. There is also some evidence to suggest that we were called the 'Butchers' given the similarity of our uniform to that of your common Butcher. W. 'Bill' Newing, W. Dedman, F. Goodall, J. A. Clark (J. E. Clarke? ), W. Johnson*. J. Ellis, J. MacGibbon, H. Guy, J. Robertson, O. T. L. O'Brien. J. Dobson*, J. Walls (Vice president), A. McHarg (Committee), W. Robertson (Vice president), F. Gillman*. T. Aram*, J. 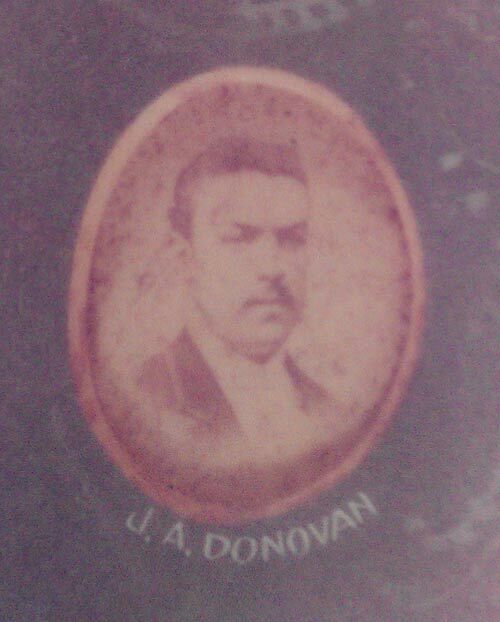 A. Donovan, G. Coppin (President), J. Conway, J. S. Dismorr? Harry Bannister, S. Wallace, T. P. Power (Sec/Treasurer), A. Blanchard, G. Kennedy. J. Williams, T. Gorman, W. Williams. The deciding match for the Challenge Cup was a 18 a side match instead of the normal 20 players on the ground. This picture is of the 23 players including 5 emergencies*, 5 officials, plus J. Conway. One of the Williams* was an emergengy. 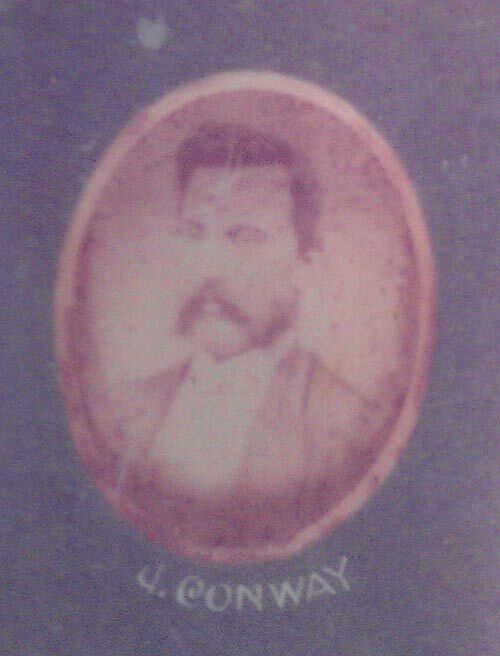 Jack Conway, Carlton captain retired during the 1871 season due to injury. This photograph was taken at the Carlton AGM Friday April 26 1872, developed and presented on the same night. Some names may be incorrect, they are difficult to read. This team line-up was revealed in a 1915 interview with Andy McHarg in the Sydney newspaper The Referee 03 March.
.*Maybe Sam was a nickname for Tom Gorman? Carlton played 8 matches Won 5 Lost 0 Drew 3. Carlton held it's Annual General Meeting at the Carlton Club Hotel. Donovan took on the captaincy after Conway suffered a severe injury that curtailed his playing career. Orange cap with blue band abandoned for one of dark blue. Players for the Blues included J. Donovan, Harry Bannister, Conway, Francis A. Dismorr, W. Grey, Frank Goodall, Hillsden, Johnson, G. Kennedy, O'Brien, John Macgibbon, Newing, Taylor, Williams , Muir Dedman and Clarke. Carlton, Melbourne, Albert Park and South Yarra, the clubs that played for the Challenge Cup in 1870 met. Albert Park secretary announced that Albert Park would not compete for the Cup. So Carlton, Melbourne, and South Yarra decided that the two teams which had won most games at the end of the season should play one grand match for it. Carlton played Melbourne for the Cup. Carlton won 2-0 Goals. Dedman , Clarke. Against Melbourne; 4 matches-2 goals to Carlton, Melbourne nil. One victory to Carlton, 3 games drawn. Against Albert Park; 2 matches-2 goals to Carlton, Albert Park nil. Against Geelong; 1 match-2 goals to Carlton, Geelong nil. Against South Yarra; 1 match-1 goal to Carlton, South Yarra nil. June 24 Collingwood at Royal Park. Carlton AGM at the Carlton Club Hotel. Finances said to be in an excellent condition. Last season the club had played 9 matches, Won 2 Lost 2 and Drawn 5. 11 goals for, 4 against. Committee; Guy, F. Hillsden, Kennedy, McCarthy, Donovan, O'Brien, Williams, Duncan, McHarg. The opening match of the season was fixed to take place on May 27 when Carlton will meet Geelong at Geelong. A vote of thanks was passed to Mr. T. P. Power the hon sec. and treasurer, for his exertions on behalf of the club during the past year. Several new members were admitted. Practice match at Royal Park. 4,000 people attended a public meeting held by the Early Closing Association in the Melbourne Town Hall. The group were urging for the introduction of the a half holiday to be introduced for Saturday afternoons. A large number of employees had to work all day Saturday. They wanted to have the benefit of of the half holiday extended to their members who were mainly shop employees, so they could persue family and recreational interests. "...... and this always popular game shows signs of becoming more popular still. Public feeling is very much in it's favour, and the numbers of spectators who crowd the ground when any match even of slight importance is played, shows great interest is taken in it. It is hoped that nothing is done to disturb this harmonious state of things, and that the game will always be played in a fair and open manner, without undue roughness. This will commend it to the popular taste, and the game will be much encouraged." The World vs The Natives match at the Melbourne Cricket Ground. This match was supposed to have been played last week, but postponed because of the weather. 22 players were named in the list for each team. The World team; Uniform, a White or Blue cap. J. Donovan, J. Duncan, H. Guy, F. Hillsden, O. O'Brien, T. Power, W. H. Williams. The Native team; Uniform, a Red cap. Carlton played the Carlton United club in a scratch match match at Royal Park at 3pm. Carlton played a practice match in Royal Park. Carlton players were requested to attend this practice match and the following one on Monday. W. Barfoot, H. Bannister, Brearly, H. Barry, J. Conway, J. Clarke, Duncan, Donovan, Dismorr, Dobson, Dalton, D. Disher, A. Forbes, T. Gorman, W. Gorman, J. H. Guy, F. Goodall, Glennon, F. Hillsden, Healy, Johnstone, Kennedy, W. Kneen, T. Kneen, D. Murray, T. McCarthy, S. Muir, McGibbon, McHarg, McNamara, Miles, W. Newing, O'Brien, O'Connell, Power, Robertson, Shaw, Todd, W. Williams, J. Williams, Waugh. May 22 Monday, Queen's Birthday. The secretaries of the various football clubs met at Garton's Hotel Swanston Street at 8pm, to arrange matches for the coming season. Carlton held a practice match in Royal Park at 2.30pm. Start of the 1871 season. Carlton played Geelong at the Argyle Street Geelong ground. The Blues left from Spencer Street station (now Southern Cross) on the 12.10pm train. The Geelong club provided a nice light luncheon with the usual accompanying beverages at the adjoining Argyle Hotel. A large crowd watched a skillfull contest. At the upper end of the ground the crowd was 4 to 5 deep with carriages and buggies of all kinds behind them. Many smartly dressed women attended. Eight players missed the match, most notable Guy, Duncan, Clarke, and Bannister, but the game got underway with 15 aside. The Pivots were missing good players as well. The game commenced at 3pm. "Since last season the Geelong ground has been much improved, the paths which used to run across having been dug up and levelled; being much softer for spills than was formerly the case. This is an example that might be followed on grounds about town, notably on the Melbourne ground." T. Todd kicked the first goal after 15 minutes play, and G. Kennedy emerging from a scrimmage, added the second and winning goal at 4.40pm. The Blues missed many easy chances with poor kicking. J. Conway (Capt),George Atkinson, Bannister, Jim A. Clark, F.D. Disher, Donovan, Duncan, A.Forbes, J. H. Guy. T. Gorman, F. Goodall, F. Hillsden, Johnstone, Kennedy, W. Newing, O'Brien, T. Power, T. Todd, W. Williams, J. Williams. Brearley, Dobson, Macgibbon and S. Muir. Carlton won; 2 - 0. Goals; T. Todd, G. Kennedy. Best; Donovan, Goodall, Hillsden, Johnston, Conway, Newing. The secretaries of the Melbourne, Carlton, Albert Park and South Yarra clubs met Garton's Hotel. These clubs played for the Challenge Cup last season. Albert Park said they would not compete for it this year. It was decided that the three clubs should play three matches against each other, and at the end of the season the two clubs that had won the most matches should play off for the Cup. Last year the South Yarra Football Club presented the Challenge Cup for competition. Albert Park became the holders and claimed it outright. 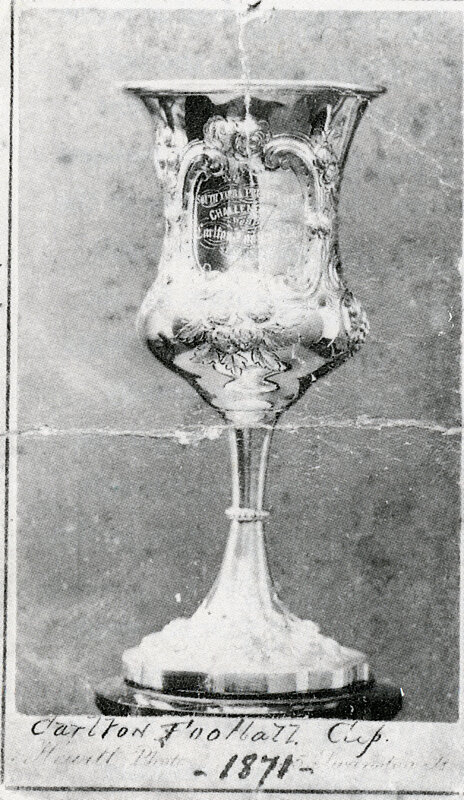 The Cup had to be won four times before it became the property of one club. The Parkites had three wins, but the fourth was by a walkover of the Hobson's Bay. Albert Park wanted to claim this as a win, but the South Yarra club who had the right of settling all Cup disputes, ruled against them. The other clubs backed South Yarra on this point. Albert Park ignored South Yarra's right to decide. Feelings ran very high and Albert Park eventually returned the Cup to the South Yarra Club. South Yarra ruled that Albert Park had forfieted the Cup because of non-compliance with the rules. Carlton played the annual President vs Vice President's match at Royal Park. Play to commence at 2pm. John Conway captained the President's team. Robert Robertson captained the Vice President's team. Carlton was to play Mebourne at the Melbourne ground. This match did not go ahead due to the downpour, and was postponed. Both teams were ready to play, but the weather had the final say. T. Power, Dismorr, Muir, Dobson and W. Gorman. Carlton hold a practice match at Royal Park. One or two Carlton players played for Albert Park against Melbourne, but they couldn't help the Parkites being defeated 0-4. Carlton 15 aside were to play a Collingwood 20 side in Royal Park. H.Bannister, J.Conway (Capt) Charles L. Chessell, D. Disher, J. Donovan, A. Forbes, F. Goodall, T. Gorman, W. Johnson, G. Kennedy, O'Brien, Taylor, T. Todd, J. Williams, W. Williams, T. Power, J. Dobson and S. Muir. The Collingwood team failed to show, and the Blues played a scratch match despite the rain. Carlton were to play South Yarra at Royal Park. South Yarra were unable to field a team. The Leader says "It is more than probable that this will continue to be the case until the (Melb) Grammar School and Wesley College reassemble after their winter vacation, for the two schools furnish the better portion of the team." Carlton instead, held a practice match at Royal Park. Carlton Second Twenty play Albert Park at Albert Park. The team met at the Post office at 2pm and proceeded to Albert Park. Aram, Brearley, T. Brisbane, Browning, Crockett, Cavin, Dobson, Fullarton, Gillman, Healy, W. Hassett, Johnson, K. Kennedy, McGibbon, Curtis McFarland, Murphy, Muir, Power, Pattison, Reilly, - Ryan, Sharp, Taylor and Wills. Carlton plays Melbourne at Melbourne (Richmond paddock). A well contested game watched by several hundred people. The Age made a comment "It is becoming a notorious fact that, as far as the general public are concerned, the game of football is one of the most popular of the day. Before it cricket has to pale..."
The Leader said, "Both clubs are strongly represented, and comprising, as they nearly all do the best players in the colony, a brillant display of football is safely anticpated." The weather was threatening but there was little wind, and 18 players a side were played. J. Conway won the toss and kicked to the eastern end. The reporter said it was the most desperate game he had seen with many shirts torn from the players backs, and players "lifeless" bodies stretched at full length on the ground while the game raged about them. The reporter laments the rough and tumble aspect developing in the game and the many scrimmages which are also a disgrace, and these relate directly to the umpires not adhering to the running with the ball rule. He says the captains should insist that the players run no further than it is necessary to undertake a drop kick. Crowd encroachment was a major problem and the match was stopped several times to try to clear the playing arena. The umpire called a halt to the game at 5pm. and "bought an end to one of the toughest and roughest football encounters ever witnessed in the Richmond Paddock." H.Bannister, F. Baker, J. Conway (Capt), C. Chessell, J. Clarke, J. Donovan, D. Disher, J. H. Guy. T. Gorman F. Goodall, F. Hillsden, W. Johnson, G. Kennedy, J. Macgibbon, W. 'Bill' Newing, O'Brien, T. Power, Taylor, J. Williams and W. Williams. Emergencies; Forbes, Francis A. Dismorr, Muir, and Dobson. Best players; Guy, Donovan, Clarke, Newing, T. Gorman "always deserves special mention for having hurled destruction into the Melbourne ranks on two or three occasions", Francis A. Dismorr "came completley out of his shell, astonishing friends and foes alike with dash and pluck." "It is becoming a notorious fact that, as far as the general public are concerned, the game of football is one of the most popular of the day. Before it cricket has to pale its ineffectual fire, and bowling to hide a diminished head. Nevertheless, we have in Melbourne almost numberless cricket and bowling grounds. During the winter months these are allowed to lie idle and fallow, waiting for the good time which the summer with its bright sun and zephyr breezes bring; then they wil be astir with life and animation. But in the meanwhile the football players have to pursue their pleasure under immense disadvantages. The place to which they most resort is the Richmond Paddock, and that is crowded with trees of a dingy and disreputable character. Highly dangerous to the players (for a week ago a man was nearly killed by one of them); they are neither of use nor ornament to the suburb in which they are allowed to exist. We want a good football ground, free of impediments, and so marked out that the genus larrikin cannot intrude on it, and the Government or the corporation should give it to us at once." A Carlton (15) played a Richmond (20) at Richmond paddock. The Melbourne ground was not available and the second best spot in the paddock was secured by a Richmond representative who arrived very early on Saturday morning to deter the junior teams from the using the site. The senior clubs seem to have the right to play where they please. Only 13 Carlton players turned up with Guy and Hillsden being absent. The loss of these two made Richmond the favourites. The Blues played with 13 and Richmond trimmed their numbers accordingly to 18. Richmond won the toss and kicked with the wind. H. Bannister, Conway, Donovan, Francis A. Dismorr, Guy, Goodall, Hillsden, Johnson, G. Kennedy, O'Brien, Macgibbon, Newing, Taylor, J. Williams, W. Williams and Muir. 3000 spectators witnessed a riot at this game when the playing area was invaded by a 400 Richmond roughs who refused to move. The mob hindered the Carlton team at every opportunity and got between them and the ball whenever Richmond were near to it. Almost every player on the Carlton team was bashed, wounded, tattered and torn, one player having thrown one of the mob to the ground turned to see how the game was going and was then struck with knuckledusters to the face knocking him out. Conway called a count of his players, then with agreement with the Richmond side the game was called off. The Leader said "There is no doubt Carlton would have come off victorious had a fair field been given to them." Best; Kennedy, Bannister, Francis A. Dismorr, Goodall, Donovan, Guy, Conway. "If anyone had doubted the popularity of this branch of athletic sports, a visit to the Richmond paddock on Saturday would at once have disabused his mind of that idea. The place was alive with footballers of all shapes and sizes. On entering the gate off the Richmond road he would first of all have encountered the Carlton and Richmond players; then a little further on were the East Melbourne and Southern clubs engaged in fierce strife; still further, on the Melbourne ground, a scratch match was being played, and almost all other available space smaller fry were ardently engaged. It is this very popularity, however, which is going a good way to put a stop to the game except when played on enclosed grounds, as will be shown in mentioning the scene attendant on the Carlton and Richmond match. Large crowds of spectators were in the paddock witnessing these various games, but most of all, of course, were congregated around the spot where 15 of Carlton were playing 20 of the Richmond Club. This match, was not commenced till half past 3 o'clock, was put to an end shortly after 4 o'clock, partly by the spectators encroaching on the playing ground, but principally owing to the unseemly conduct of those who cannot be dignified by a better title than that of Richmond larrikans. These beauties, in addition to crowding on the ground and making use of extremely choice expressions in urging on the Richmond Club, would get in the way of the Carlton men, threatening to mob them, and use other methods of polite treatment. This is exactly the way they acted when Richmond played the Melbourne Club. Then, as now, there was nearly a free fight after the match, but I refrained from mentioning it, thinking it was only an exceptional case. But seeing now they have acted in almost a worse manner on the very next occasion, makes me think "there's a method in their madness," by which, if their local club cannot win by fair means, they intend to all they can to hinder their opponents winning. It is not for a moment to be inferred from these remarks that the members of the Richmond Club have anything to with this conduct, but it is very possible that they may have some means of persuading the mob that accompanies them to behave like respectable people. The Richmond men play a good game, and cannot easily be beaten, if at all, when playing at the odds of 15 to 20, by either the Carlton or the Melbourne, and it would be a pity if interesting matches of this sort should have to be put to an end by conduct such as above described." Carlton Second Twenty played Collingwood in Royal Park. Aram, Brearley, Browning, Browning, Crockett, Cavin, Dobson, Donaldson, Fullarton, Glennon, Gillman, Healey, W. Hassett, Kennedy, McNamara, Morris, Murphy, C. McFarland, W. Marshall, Power, Pattison, Reilly, Sharpe. Carlton played Albert Park on Royal Park. Royal Park is a good ground to play on when compared to other grounds, as it is free of all ruts and rough places, but it has no defined boundaries. This leads to disputes as the supposed boundaries on both sides run between some far off trees. The Blues played for most of the match with 18 men until two substitutes were found. The Leader said "The success of Carlton is mainly due to the manner in which each kept his appointed place, and the support they gave to each other in cases of emergency". The Blues missed some very easy chances to goal. The Carlton captain J. Conway received a sever knee injury which according to the report will keep him sidelined for several weeks. This may have been Conway's final game for the club as a career ending injury forced his retirement this year. H.Bannister, J. Conway (Capt. ), Donovan, Dismorr, Disher, T. Gorman, W. Gorman, Goodall, Hillsden, Johnson, Kennedy, Macgibbon, Newing, O'Brien, Power, Shaw, T. Todd, John Wolfe, J. Williams, W. Williams and Muir. The Carlton Reserves played Albert Park at Royal Park. Players met at the Town Hall at 2pm. Aram, Brearley, Browning, Browning, Cavin, Dedman, Dillon, Dobson, Fullarton, Gillman, Glennon, W. Hassett, Healy, Morris, Murphy, Marshall, Pattison, Reilly, Sharpe, Robertson, Taylor, Wall. Carlton 15 played a Richmond 20 at Royal Park. A fair attendance of spectators were at the Park with surprisingly less larrikins than usual. The match was to commence at 2.30pm. but did not start till well after 3pm as the Blues could only muster seven for the fifteen players selected. Substitutes were found. "The match was pretty evenly contested, but what balance there was, was in favor of Carlton who kicked through Kennedy the only goal of the day." Bannister, Conway, Donovan, Dismorr, Guy, Goodall, Johnston, Kennedy, Macgibbon, O'Brien, J. Robinson, T. Todd, Wolfe, J. Williams, W. Williams. Emergencies; Hillsden, W. Gorman, Dillon, and Muir. J. Conway is still unavailable with a sprained knee. Carlton were not as strong as usual with two of their heavyweights in Conway and Gorman missing. "As the teams stood facing each other prior to commencement of hostilities, one could not help being forcibly struck by the different appearance of the opposing teams. The Melbourne team was composed of a fine even-sized lot of players, not too heavy to be lithe and active, and yet sufficiently weighty to combine activity and strength. The Carlton on the contrary were rather light, and impressed one with the idea of activity without any great strength, and the general impression of the onlookers seemed to be that the metropolitians would prove too weighty for their opponents." Melbourne had the better of the play for the first 30 minutes, then Carlton played the better football for the reminder of the match, but both teams were unable to score. A large crowd attended which the police detachment kept from encroaching on the playing arena. Clarke missed a couple of chances to goal in the second half. The match continued till after 5pm and ended in a draw. Bannister, Clark, Donovan (Capt), Dismorr, Deadman, Guy, Goodall, T. Gorman, Gillman, Hillsden, Kennedy, Macgibbon, Newing, O'Brien, J. Robinson, Shaw, T. Todd, Wolfe, J. Williams, W. Williams. Emergencies; W. Gorman, Dillon, Sharp and Muir. Best players; Dismorr, Donovan, Goodall, Guy, and Hillsden, Clarke. Players mentioned; Donovan, Guy, MacGibbon, 'Lanty' O'Brien, Goodall, Williams, Kennedy, Clarke, Gorman, Dismorr, Hillsden. This is a reproduction of an article, via Trove, from The Australasian August 12 1871 (p12). The article is about the Carlton vs Melbourne match at Royal Park of August 05 which ended in a 0-0 draw. The writer makes some keen observations about walking from the city to the Royal Park venue, the players, the game, and the crowd. The first few paragraphs have not been included. As the Williams brothers Jim and Bill were playing for Carlton, the report only mentions the surname, and not knowing which one it refers to, I have linked or highlighted the bio pages of Jim with the first mention of "Williams" and Bill to the second. All other Carlton players are linked as well. The reader will see James Byrne and Charles Forrester, both of Melbourne, are also linked. This is because they were former Carlton players, Byrne being one of the Carlton originals. "It was an interesting study, but I declined, and avowed my intention of going out to the Royal-park to see the football match between Melbourne and Carlton. Fitzroy and the baby show were consigned to the metaphorical "blazes" at once; the match would be a splendid one. Capital idea; when did it commence. My friend was a firm believer in cricketing, football, and other outdoor sports, and I knew the babies stood but a poor chance when I mentioned what was to be witnessed in Royal-park. So we decided, and finding plenty of time on our hands, resolved to walk out there. Avoiding Elizabeth-street, with its noisy traffic, its importunate cabmen, and its dust, we struck up through Swanston-street into Carlton, and made for the classic halls (?) of Alma Mater. We passed the gaol, a brewery, and some flour mills, the streets not presenting a very lively appearance, the traffic being chiefly monopolised by woodcarts and tradesmen's vehicles. Almost every other house was a public, and all the intervening spaces appeared to be filled up with wood and coal yards. Here and there, we came upon a knot of youthful larrikins playing the ancient game of marbles on the footway, or others younger still sailing mimic boats in the traditional gutter. Every now and then a small eddying whirlwind of dust would break at our feet and fill our eyes and nostrils, and we were not sorry when we found ourselves within the university gates. After a short look at the museum, we scaled the fence behind, and after passing that cheerful-looking structure styled Trinity College, shortly after reached the welcome green sward of the park. Although early, a crowd was already collected. Most of the Carlton players had arrived, and having doffed their coats and hats under a tree, amused themselves with the ball until their opponents came. Some time elapses ere these arrive, but a couple of overloaded cabs are seen to enter the park gates, and driving up the winding road, come to a stop just by that old shed, the sight of which reminds one always of the ill-fated Burke and Wills. They are the Melbourne men, sure enough. From front, behind, the side, like startled frogs from off a sunny bank, they leap down from the cars, and with chaff, and jokes, and laughter, spread themselves over the ground to relieve their limbs, cramped from the ride from town. Ready stripped, with only a loose coat thrown over their uniform, they look in splendid trim. Fine athletic fellows all - not a chicken in the crowd. The red cap is of course universal; nearly all wear light or dark blue guernseys, with flannel trousers, and both shirts and trousers bear the stains and rents of many a well fought game. Cabby is paid, and all move off towards the ground, Freeman and young "Luff" playing practical jokes, as usual; Harrison, Byrne, and Morrell walking along quietly, discussing the plan of action. Coats are now peeled off, and given into charge of an emergency man, and the goal umpire and the policeman present are endeavouring to clear the ground overrun by the crowd. Carlton have been ready for some time, and in the absence of Conway, their leader of old, have chosen Donovan as captain. He accordingly tosses with Harrison for choice of goals, and loses. The latter takes the eastern. Both teams join the aid the constables in pushing back the crowd, and at length the space is clear. Now we can see what it is like. Grassed the whole way from goal to goal, with a bare patch here and there only; easy falls will be given to-day; players will spring up renewed in strength rather than damaged, on a springy turf like this. The ground however, is small, being not so long as the Melbourne, not yet so broad. Everything is ready, and the reds are getting impatient as the Carlton skipper gives a few last directions to his team. Taking a short run, Donovan kicks off, but the ball has not been well placed, and flies in a curving line towards the northern bounds, instead of straight ahead. Here suspended in mid-air will we leave it, while we take a look at the field, and see how the men are placed. Conway sprained his leg very severely while playing against Albert-park a fortnight before, and his team will feel his loss to-day. Donovan of course, has not placed himself, or Guy; wherever the ball is there are they. McGibbon plays in front of goal, with Goodall as its keeper. "Lanty" O'Brien was forward, near the southern bounds, and Williams thereabouts, while opposite played Kennedy and others I cannot name. which Englishmen are said to love, and which is in every way is favourable to football. The ball kicked off by Donovan now reaches the ground, and Ryan is first to handle it. Dodging the rush of the foremost Carlton man, he sends it along the side, and there, near Morrell, a scuffle ensues, and it is out of bounds for the first time. Quickly thrown in, Kennedy and two others carry it across the ground, dodging the elder Loughnan and Goldsmith, but Byrne meets it, there is a slight scrimmage under the tree, and Riggall sends it back to Hepburn, who drives it in front of goal. Carlton now rally it up the centre half way, but it is quickly down again; young Harrison has it; Hepburn takes it on close to the western goal, is rushed by three or four, but obtains first blood for Melbourne by sending it in "behind." "Rouse up Carlton. Go in there," cries Donovan, as a splendid place kick from Goodall sends the ball in a long, graceful curve well into the centre of the ground; but its of little use, back it comes again. Freeman comes out of a scrimmage like a mouse, and sends it straight to Morrell on the northern side; they've collard him, but he sticks to the ball and on his feet well; Finlay is there to help, big Loughnan "wires in," the former gets it clear, but is forced to kick across and Hepburn again is in luck's way; rushing in, he smothers the ball on the bound, and with a quick left footer sends it straight to young Luff's arms; but the latter's judgment failed him now, and not 10 yards in front of the goal he missses a splendid chance. Macgibbon takes it out from the scrimmage that followed, and away up the centre it goes, and Melbourne bites their lip and say, "Had Carr been there we would have had a goal." Carlton now warm up and are playing well. By a series of fine marks they carry the ball right through the play, and finally rush it in behind the Melbourne posts, amid approving shouts from the motley crowd around. Ireland kicks it off, and ere long it is down to the other end again; and now a series of struggles takes place about 50 yards in front of the Carlton goal, in which many a man goes down - Melbourne and Carlton, red and blue together, roll on the grass; now Barker has the ball, and Goldsmith aids him well; the latter gets clear, but Kennedy has him down, the elder Luff goes in, and Morrell stands ready by. "Go in, Carlton;" and Guy comes to bear a hand. Almost immediately the ball is his, and away he goes, amid the clapping of Carltonian hands, and shouts of "Bravo Guy" from the throats of the Carlton crowd. He doubles and turns like a hare, crosses and re-crosses the ground in his efforts to break the red line of placed men. He is supported well, and in the centre finds a gap; but ere he can get his kick, Freeman is on him, Harrison wires-in, Williams bears a hand for Carlton, and "Lanty" leaves his post to join the fray. But, who is that bending low in that dark shirt, creeping round the scrimmage waiting for the ball to be exposed? "Look out for Byrne there," sings out Donovan, who has recognised him; but it is too late; that whispered "Blazes" was ineffectual, and Freeman let it go. Now, with one arm tight clasped around the ball, with the other he wards off the eager clutches of the Carlton men; doubling round Ryan, Loughnan keeps off the rush, he dodges Kennedy and charges Macgibbon full; but now round his neck no friendly arm is flung, and jerked backwards with a last effort, he punts with his left straight to Barker; on to Loughnan it goes, and again finds a respite behind the Carlton posts. Goodall again kicks off, and again does the duty well. The game so far has been in favour of Melbourne; it is now becomes more equal, Carlton playing up well, and marking splendidly; besides, their men know the ground; the reds begin to get careless, and several leave their places to follow the ball - a mistake nearly fatal to their goal ere the day was out. Melbourne drove the ball behind that of their opponents once more, and not long before sides were changed, young "Luff" fully retrieved his lost laurels by making a splendid mark in the middle of a crowd of rushing Carlton men, 20 yards from goal, but a nasty side kick. "Will he do it?" The odds are against it; he took a place kick and missed the post by a yard. Previous to this Duff had made a mark straight in front of the Carlton goal, and surrounded though he was, like a madman tried to rush it through; of course he failed. Had he taken his kick coolly , the thing was a certainty. The sides were changed, and now Carlton often had a decided advantage. Behind the Melbourne posts the ball was sent, and it was frequently out of bounds down at their end, in close proximity to the goal. Some of the Melbourne would leave their posts, nor did any of them appear to be playing so hard as is usually their wont at this stage of a game. They valued their opponents too lightly altogether, and the latter seemed to play up in proportion as the reds fell off. Both Donovan and Guy made capital runs; Macgibbon played splendidly, Clarke, O'Brien, Kennedy, and Gorman all distinguished themselves; the marking of the Carlton men was first class, far better than their opponents. Every now and then Byrne would wake up his men, and away the ball would go towards the Carlton goal, but the best struggles always took place in the centre of the ground, and thus swaying backwards and forwards the game went on. It was an about a quarter to 5 that an event took place that totally destroyed the pleasure of the match. Looking on at the play since its commencement, a large crowd, a proportion of which was composed of "larrikins" had fringed the ground, and the policemen told off on the southern side proved themselves of but little use in keeping these creatures back; a good number of decent people were present, but the rough, the rowdy, and the "larrikin" element from Carlton and roundabout, was very strong. In running the ball away from goal, Morrell, according to the opinion of the umpire, held it too long, and that dignitary gave a free kick therefore. In taking this, Donovan was interrupted by some low fellow, who stepped out from among the spectators and tendered his advice. He was requested by a Melbourne player to mind his own business and not interfere with the game, to which the scoundrel replied by striking the speaker, and the two closed; the ground was rushed at once, and the game stopped for nearly half an hour, while this affair was being arranged. The police were on the spot and took the man's name, and finally the game was resumed. At one time the matter bore a very ugly look, however, as the crowd of loafing rascals round were doing their best to raise the general melee but Harrison kept his men well together in a body, and the rabble curs, not liking their looks, let them alone. Donovan at last took his kick, but Melbourne were wild, and rushed the ball right away to the Carlton goal at once; but their zeal has outstripped their discretion; after a scrimmage or two it comes back along the northern side, is sent across, and finally a Carlton man made a mark straight in front of the Melbourne goal, not 15 yards away. The shouts of the crowd are deafening, the larrikins yell with delight, but it's not kicked yet. "He'll never do it," says Harrison, and he says truly, although the pulse of every beats quickly as the kicker takes his three quick steps, but - "Hurrah! safe as a church!" as the ball goes flying away behind the posts a full three yards from goal. "Now Melbourne, go in," cries Byrne," "there's only 15 minutes more," and the hardest play of all the day took place within that short quarter of an hour. The kick-off gives the reds a slight advantage, and they keep it; the ball comes no more near their goal; towards the centre a grand final scrimmage takes place. Ryan has the ball, and, eel like, writhes in the grasp of two Carlton men. Melbourne goes in to the rescue; Carlton pile on their heavy weights. Freeman goes in, and Byrne is there. Both Guy and Donovan work hard, and O'Brien's there and Kennedy, doing good service. But Duff goes in, and for a moment Ryan's free; with a wrench he clears himself, but clean from throat to waistband his shirt is torn from his body. It matters not, Byrne has the ball, and it's away up to the Carlton goal, no more to return. Ryan trotted into goal. From all the 'crowd arose' "
But it was no laughing matter now, Melbourne was doing its hardest to get a goal within the last five minutes, and many a fall is given. Riggall takes the shock of two Carltonians, and rolls them over on the sward. Forrester's weight is telling wherever he goes. Freeman plays like a demon, but it's all of no avail. Just as Baker makes a capital mark in front of goal the umpire calls "time," and the day's play is over. I rejoined my companion rather disappointed with the game. Melbourne, although playing a strong team, had not done well, and though, taking the whole afternoon's play together, they had slightly the best of it, yet i preferred the play of the Carlton men. They marked better, kicked quite as well - and there was some fine kicking on both sides - and they kept their allotted stations better than did the Melbourne men last Saturday, who, if they had played better in this last particular, should have scored at least two goals." "Out door sports have been most vigorously pursued during the past month, and from the large attendance of the public that witness the various encounters, whether in the football field or in the pedestrian arena, it may be said without fear of contradiction that there is no place south of the equator where British pastimes are more popular than in Victoria. The Metropolitan Football Club is pursuing it's usual career of victory, all other clubs round Melbourne, with the exception of the Carlton Club, having succumbed to the progress of it's players." A mixed Carlton team played the Southern club at Royal Park. An exciting game ending in a draw. G. Kennedy (Capt), Aram, Browning, Brearley, Cairn, Dobson, Disher, Dismorr, Finn, Glennon, Gillman, Healy, W. Hassett, Curtis McFarland, Murphy, Muir, Macgibbon, Paterson, Reilly, Sharp, Wright and Wallace. Match drawn; no score details. Carlton played South Yarra at South Yarra. The Blues met at the town hall at 2pm. Carlton fielded a weak team as only seven of the first twenty put in an appearance. South Yarra had not won a game so far this season and the Blues thought the task would be an easy one against this once famous club. The Blues jumped them and kicked an early goal and missed at least a half dozen other chances to goal. Gorman missed several easy chances to goal. A one stage the Blues took ten marks in a row without the South Yarrites troubling them. Bannister, Donovan (Capt), Dismorr, Dedman, Dobson, Guy, Goodall, T. Gorman, Glennon, Johnston, Kennedy, McGibbon, Newing, O'Brien, Robinson, Shaw, Sharpe, T. Todd, J. Williams, W. Williams, Wallace. Carlton Second Twenty played South Yarra Second Twenty on Royal Park. Carlton (15) played a Carlton United (20) at Royal Park. Both teams weakened by loss of several players, however the match was an exciting struggle. The Blues suffered their first defeat of the season. Harry Bannister, J. Donovan (Capt), Disher, Dismorr, Dedman, Goodall, Guy, Johnson, Kennedy, Macgibbon, O'Brien, Robinson, Shaw, T. Todd, J. Williams, W. Williams, Wallace. Best players; Donovan, Johnston, Guy, Dedman, Johnson, and Wallace. Carlton Second Twenty played Collingwood at North Fitzroy. A large number of people had gathered at the Melbourne ground to see the Carlton-Melbourne game which had to be called off due to rain. Harry Bannister, J. Clarke, J. Donovan (Capt), J. Dismorr, Dedman, J. Dobson, J. H. Guy, F. Goodall, T. Gorman, F. Gillman, F. Hillsden, H or W. Johnson, G. Kennedy, Macgibbon, W. Newing, O'Brien, Robinson, Wallace, J. Williams, W. Williams. Emergencies; W. Hassett and Shaw. Melbourne suggested that the postponed match could be played on the M.C.G. Carlton (15) played a Carlton United (20) at Royal Park at 2.30pm. The Blues were the better of the two teams, however neither side could score. J. Donovan (Capt), Dismorr, Dedman, Dobson, Gillmann, F. Goodall, H. Guy, Johnson, W. Hassett, Kennedy, Macgibbon, O'Brien, Robinson, Shaw, Wallace, J.Williams, W. Williams. Carlton Second Twenty played Carlton United in Royal Park. Carlton F. C. held a Grand Concert at the Carlton Orderly Room, Gratten Street. The first half began at 3.30pm and continued till half time at 4.30pm. The Blues kicked to the southern end for the first half. "Forward Carlton" and "Now Carlton, mark your men" would be heard from Blues' skipper Donovan. A most exciting game that was only decided towards the end of play. The back play of Guy, Donovan and Macgibbon was first class. In the gloom the umpire calls time, and the players of both teams gather to cheer each other and pay their mutual respects. The report said that this was one of the best games played at South Melbourne this season. Harry Bannister, J. Donovan (Capt), Dismorr, Dobson, Dedman, Guy, T. Gorman, Goodall, Gillman, W. Hassett, Hillsden, Johnson, Kennedy, Macgibbon, Newing, O'Brien, Robinson, Wallace, J. Williams, W. Williams, Shaw and Healy. Players mentioned; Goodall, Kennedy, Clarke, Donovan, Guy, Aram, Macgibbon. Carlton (15) played Richmond (20) at the Melbourne ground (Richmond paddock). Crowd encroachment was a problem disrupting the match. Harry Bannister, Blanchard, J. Donovan (Capt. ), Dismorr, Dedman, Dobson, J. H. Guy, F. Goodall, Kennedy, MacGibbon, W. 'Bill' Newing, O'Brien, Wallace, Williams, Williams. Emergencies; Gillman, Robinson, Shaw, W. Hassett, Muir. Best; Guy, Donovan, MacGibbon, O'Brien. "If the general opinion in the metropolis, that the members of the Melbourne Football Club are gentlemen, and that the members of the Carlton Football Club are made of somewhat inferior clay. This being the case, the townsfolk were somewhat surprised in the difference in the conduct of the gentlemen and the men from Carlton. When they visited Geelong, the Carlton players conducted themselves just as one has been to imagine gentlemen would do; but on Saturday evening, the conduct of the Melbourne club gentlemen was just what one would have expected from roughs. Arm-in-arm, several of them excited by drink, they marched up and down Moorabool-street roaring out popular choruses, frightening horses, and otherside misbehaving themselves." Carlton played Melbourne on the Metropolitan, (or Melbourne ground) adjacent to the M.C.G. The Blues were without some of it's best players. This is not a Challenge Cup game. A Large crowd attended with spectators spilling on the the playing arena causing problems for the players despite the best police efforts. A bruising rough encounter in which several players were injured. Dismore recieved a blow to his chest which incapacitated him for a long time. Harry Bannister, Blanchard, J. Clarke, Donovan, Dismorr, Dedman, Ellis, S (T?). Gorman, Goodall, J. H. Guy, F. Hillsden, W. Johnson, Kennedy, Macgibbon, W. 'Bill' Newing, O'Brien, Robinson, Wallace, Williams, Williams, A. Warne. Emergencies; Dobson, Gillman, W. Hassett, Muir. When the game was discontinued, Melbourne had scored 1 goal. Thomas P. Power the Carlton goal umpire, gave the goal to Melbourne but he was unsure of the rule as the ball had bounced off the knee of the Melbourne player (Thomas). T. P. Power in a letter to The Argus, 0ctober 2, said on reading the rules which states that it must be "kicked", which he considers from the foot, Power had determined that he considers it to be "no goal". Carlton and Melbourne played off for the South Yarra Presentation Challenge Cup at neutral ground Albert Park at Emerald Hill. A letter to the Australasian 51 years later (September 02 1922 p25) said the ground was on Albert Road, between Clarendon and Moray Streets, Emerald Hill, ie; the Lake Oval. Before the season it was decided that the best two teams should play one match for the Cup. The clubs played 18 a side, instead of the usual 20. A large crowd attended and the goals were pitched east-west the wind blowing diagonally across the ground. Donovan won the toss, and kicked with the aid of the breeze, the game getting underway at 3pm. Dedman scored the first goal in the first 10 minutes. Just before half time Clarke marked within range, but on a difficult angle scored the second goal. In the second half Melbourne threw everything at Carlton, but the Blues defence held firm. In the final 15 minutes the crowd encroached onto the ground, which made it difficult for the players and umpires. Carlton won the three hour struggle 2-0, and now permanently hold the trophy. John Donovan (Capt), Bannister, Blanchard, Clarke, Dedman, Dunmore/Dismore/Dismorr?, Ellis, F. Goodall, T. Gorman, J. H. Guy, Hillsden, Kennedy, Macgibbon, Newing, O'Brien, Robinson/Robertson?, Wallace, Williams. Best; Guy, Donovan, Clarke, Robinson, Ellis. This team line-up was revealed in an 1915 interview with 1871 committeeman Andy McHarg in the Sydney newspaper The Referee 03 March. 18 players aside were on the ground for this match.
.**After the passing of 44 years perhaps Andrew McHarg had snuck himself into the team? McHarg's playing list differs a little from the team picture at the top of this page. Carlton Football Club wound up their season with a President vs Vice Presidents match at Royal Park. Captains Thomas P. Power and Robert Robertson. All Members of the club (first and second twenties exculsive) are to join in. A letter to editor of The Weekly Times October 15 p5. The Australasian's two part review of the 1871 season. The final installment of the Australasian's review of the 1871 football season. 1871. Premiers. Carlton, 2. Melbourne, 3. Albert Park. The Carlton Story. Hugh Buggy and Harry Bell . Pages 25,26,27,259. Mullin's Footballers Australian Almanac of 1951. Page.66. Illustrated Australian News for Home Readers, 1871 editions. The Referee, Sydney 03 March 1915. The Weekly Times, 1871 editions. Page last modified on Saturday 15 of September, 2018 10:25:13 AEST by blueycarlton. 1977 - Craig Davis to play on is a risk (31/03/77). 1987 Rd 19 - Tom Alvin flies high for a mark.